I visited Jamie Kutch in March 2015 at is relatively new digs in Sonoma to talk about Pinot Noir, see his new winery setup, and check out his newly born son. I recently wrote extensively about Kutch Wines and reviewed the 2013 vintage wines in the PinotFile: www.princeofpinot.com/article/1274/, so no need to go over the winery’s background again. We tasted some older vintages as well as two wines out of barrel. Refer to my previous tasting notes on the 2009-2013 wines to see how they are progressing based on this tasting. Jamie feels that the 2013 and 2014 vintage wines made in his new winery have more expressive fruit due to his complete control of all of his own equipment. The first wines were barrel samples. 2014 Kutch Santa Cruz Mountains Chardonnay A blend of fruit from Trout Gulch and Zanate vineyards. A barrel-fermented beauty with bright, fresh aromas and flavors of citrus and apple. Good cut and vibrancy. Very promising. 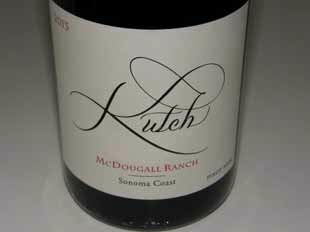 2014 Kutch McDougall Ranch Sonoma Coast Pinot Noir Most know that Kutch is a proponent of whole cluster fermentation. This was an eye-popping demonstration of the difference between 100% de-stemmed and 100% whole cluster Pinot Noir. The wine from the de-stemmed barrel was simple and not distinctive. The wine from the whole cluster barrel offered more aromatic and textural interest, and was more complex and nuanced. The difference was dramatic. The following finished wines were tasted from bottle. The tasting notes are not detailed since this was a friendly, informal tasting and chat. 2009 Kutch Sonoma Coast Pinot Noir Sourced from Sonoma Stage, Nobles and La Jons vineyards. Several suitcase clones. 75% whole cluster. 50% new oak. Very ripe, fruit-driven, rather ordinary with modest tannins. Good. 2009 Kutch Savoy Vineyard Anderson Valley Pinot Noir 100% whole cluster. 100% neutral oak. Some green herbal notes on the nose but not on the palate which featured flavorful black cherry fruit backed by firm, but not intrusive tannins. Good. 2009 Kutch McDougall Ranch Sonoma Coast Pinot Noir 50% whole cluster. 50% new oak. The best of the three 2009s. Nicely flavored ripe, spicy cherries with a slightly gritty tannic backbone. Has opened up nicely since I lasted tasted it in 2011 with softening of tannins. Very good. 2011 Kutch Sonoma Coast Pinot Noir A blend of fruit from Campbell Ranch Vineyard in Annapolis (sandy, Goldridge soil) and Sonoma Stage Vineyard in the Petaluma Gap (heavy clay). 25% whole cluster. A showy wine drinking perfectly now with a lovely marriage of black cherry, spice and savory notes. Very soft tannins. Excellent. The point about the soils is that Jamie has learned to match oak regimen with soils. Sandy, Goldridge soils produce more feminine wines that shouldn’t be exposed to too much new oak. On the other hand, clay or rocky soils produce more intense fruit that matches better with higher amounts of new oak. 2011 Kutch Savoy Vineyard Anderson Valley Pinot Noir 12.9% alc.. 50% whole cluster. Dijon 115, 667, and Pommard and Martini clones. A very savory nose leads to a feminine wine with soft tannins, good acidity and flavors of edible flower, cherry and spice. The finish is suave and lengthy. Excellent. 2011 Kutch Falstaff Vineyard Sonoma Coast Pinot Noir 12.7% alc.. 50% whole cluster. 50% new oak. This vineyard is located at a very cold site and is the last picked. Goldridge soils. More concentrated and sappy, featuring flavors of blackberry, black raspberry and cassis. Velvety smooth in the mouth with modest tannins. Excellent. 2012 Kutch Falstaff Vineyard Sonoma Coast Pinot Noir 12.9% alc.. 100% whole cluster. Concentrated, robust core of darker fruits with an earthy, spicy, floral and mineral-driven underpinning. Complex and intriguing. Still sporting noticeable tannins, but the wine has interesting textural qualities. Still young. Excellent. The 2013 Kutch Pinot Noirs are all 100% whole cluster fermented and are stunning wines that offer the best features of whole cluster vinification without the greenness or heavy tannic load that can ruin the party. 2013 Kutch Sans Soufre Sonoma Coast Pinot Noir Produced without sulfur. 100% whole cluster. Aged in neutral barrels. Harvest Brix 19.5º, pH 2.95. A pleasant, lighter weight wine with fresh scents of cherry and rose petal. Vibrant flavors of cherry and raspberry in a Beaujolais style with lively acidity. Very good. 2013 Kutch Sonoma Coast Pinot Noir 12.3% alc.. Campbell Ranch, Sonoma Stage and Le Jons vineyards. 30% new oak. Very charming and forward drinking now featuring darker berry fruits with notes of spice and rose petal. Impeccable balance. Very good. 2013 Kutch Falstaff Vineyard Sonoma Coast Pinot Noir 12.3% alc.. 30% new oak. A feminine wine with exquisite balance featuring a plethora of red fruits and hi-tone accents of spice and rose petal. Very suave and seductive, with refined tannins and uplifting acidity. Very good. 2013 Kutch Bohan Vineyard Sonoma Coast Pinot Noir 12.3% alc.. 30% new oak. Grapes sourced from own-rooted, dry-farmed, head-trained vines planted in the Graveyard Block. The sprawling vines produce grapes of variable ripeness. The nose is both fruity and savory. Richly fruited on the palate with darker cherries and raspberries. Still sporting firm, gritty tannins. The finish on this wine is remarkably intense and long. Excellent. 2013 Kutch McDougall Ranch Sonoma Coast Pinot Noir 12.2% alc.. 50% new oak. Noticeably darker in color with a dreamy concentration of black cherry, boysenberry and blackberry fruits. This wine makes you sit up and take notice. The young tannins are firm but balanced. Excellent.